I spend a lot of my time doing research related to understanding how to communicate in a culturally appropriate manner with bicultural audiences. This is increasingly important because bicultural Latinos are a growing segment of the US population and yet epidemiological evidence suggests they are at high risk for poor health. In one study published last year in the Journal of the Academy of Nutrition and Dietetics, we found that Mexican-American described food as central to expressing cultural identity. Yet Mexican food traditions were characterized as unhealthy; many preferred American foods, which were seen as healthier. Among the participants who expressed a desire to eat healthfully, to do so meant to reject Mexican ways of eating. 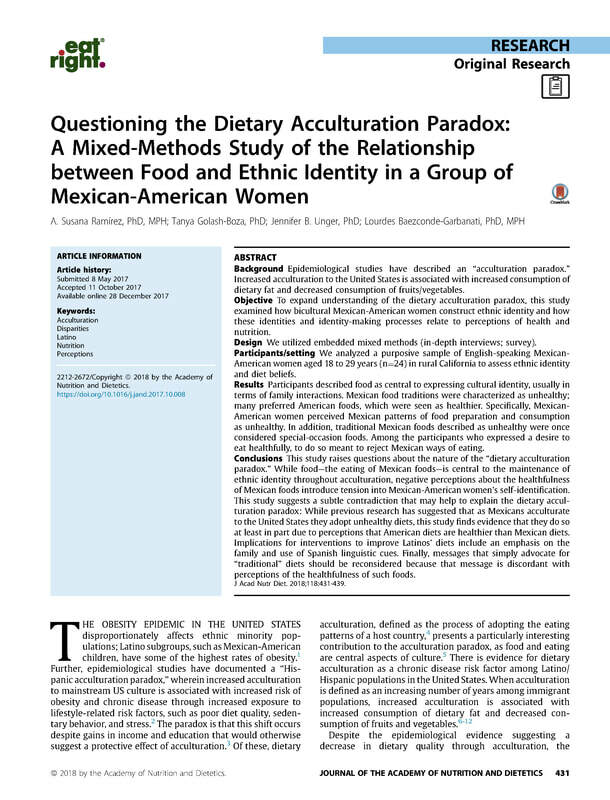 This study raises questions about the nature of the “dietary acculturation paradox.” While food—the eating of Mexican foods—is central to the maintenance of ethnic identity throughout acculturation, negative perceptions about the healthfulness of Mexican foods introduce tension into Mexican-American women’s self-identification. 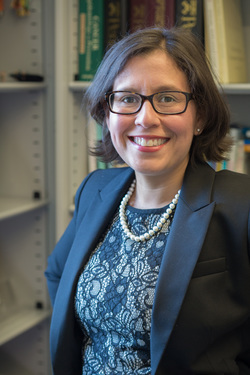 This study suggests a subtle contradiction that may help to explain the dietary acculturation paradox: While previous research has suggested that as Mexicans acculturate to the United States they adopt unhealthy diets, this study finds evidence that they do so at least in part due to perceptions that American diets are healthier than Mexican diets. 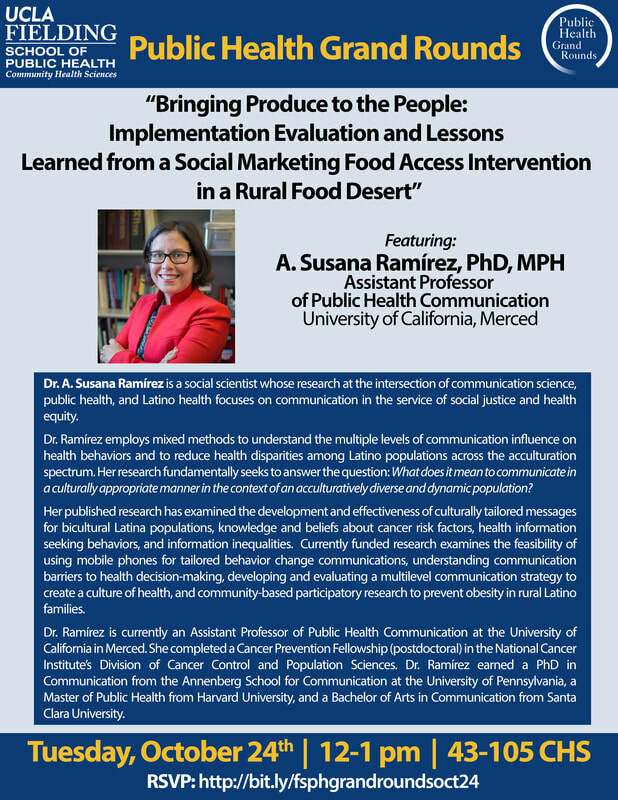 Implications for interventions to improve Latinos’ diets include an emphasis on the family and use of Spanish linguistic cues. Finally, messages that simply advocate for “traditional” diets should be reconsidered because that message is discordant with perceptions of the healthfulness of such foods. 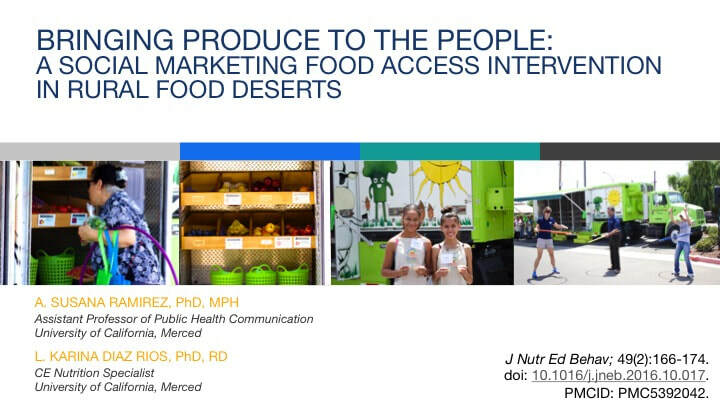 How would you go about designing effective nutrition education messages for this group? 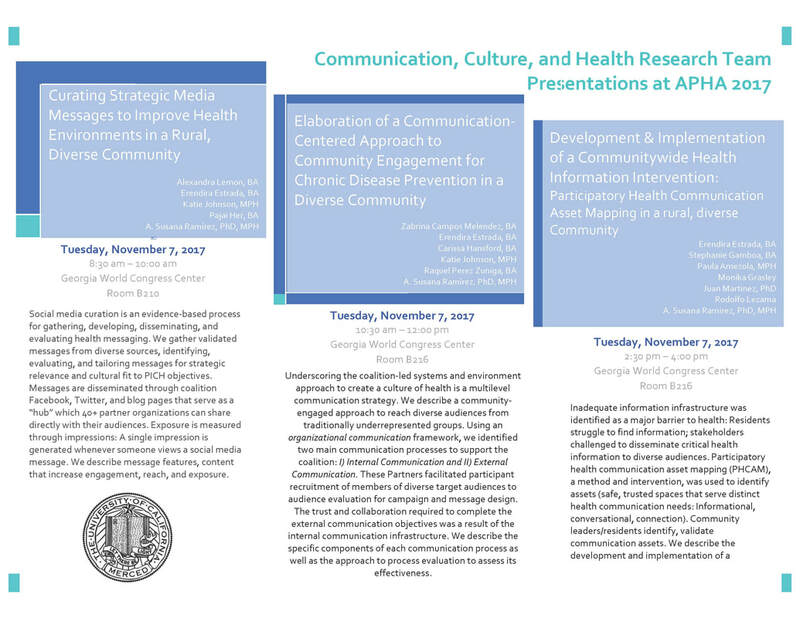 Are you interested in health, social justice, policy, or communication? 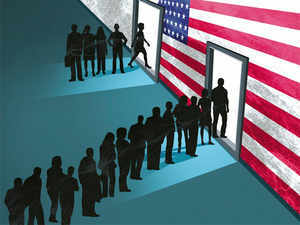 You may want to apply for our research assistant position in immigration policy. Please see attached or here for more information and apply by December 17, 2018. 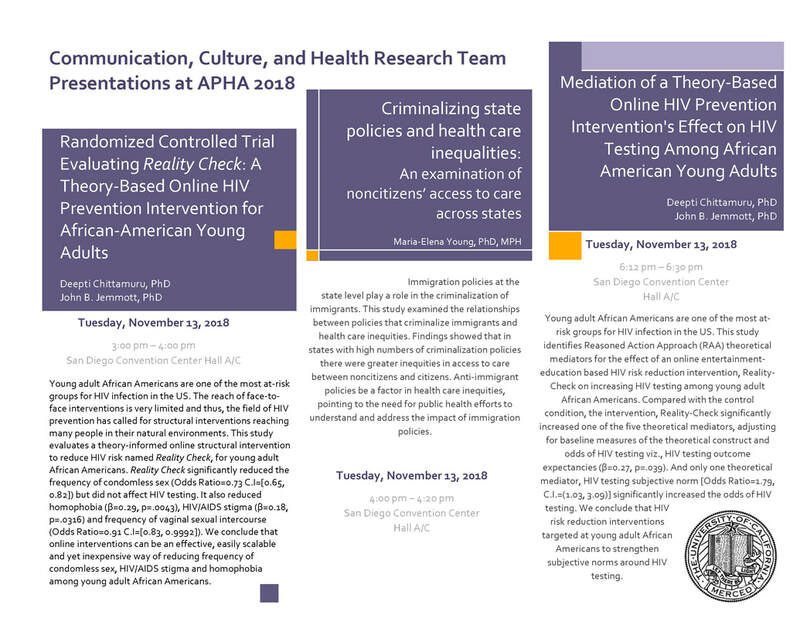 The Communication, Culture, and Health research team is back from Atlanta with a great report from the American Public Health Association's annual meeting. ​Alex Lemon (BA, 2017) gave a fantastic presentation on the to a standing room only crowd. Erendira Estrada (current Public Health PhD student) delivered a fabulous talk on an ecological approach to communication intervention. In between those talks, I talked about a communication centered approach to engaging communities in research and intervention development. I also was awarded the 2017 Early Career Award from the Public Health Education and Health Promotion section. The award honors a scholar who has made outstanding contributions to the practice and profession of public health promotion in the first 10 years after the Ph.D. and who shows promise for continued development. I am honored to have been nominated on behalf of the association’s Health Communication Working Group. 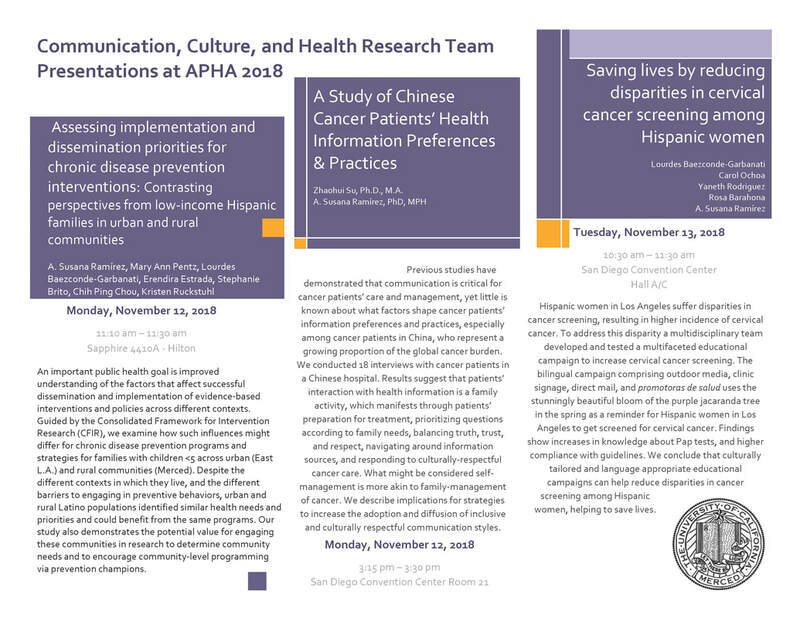 Registration is now open for our webinar on Monday, November 13! Click here to register. Free for members of the Society for Nutrition Education & Behavior; $25 fee if you are not a member. 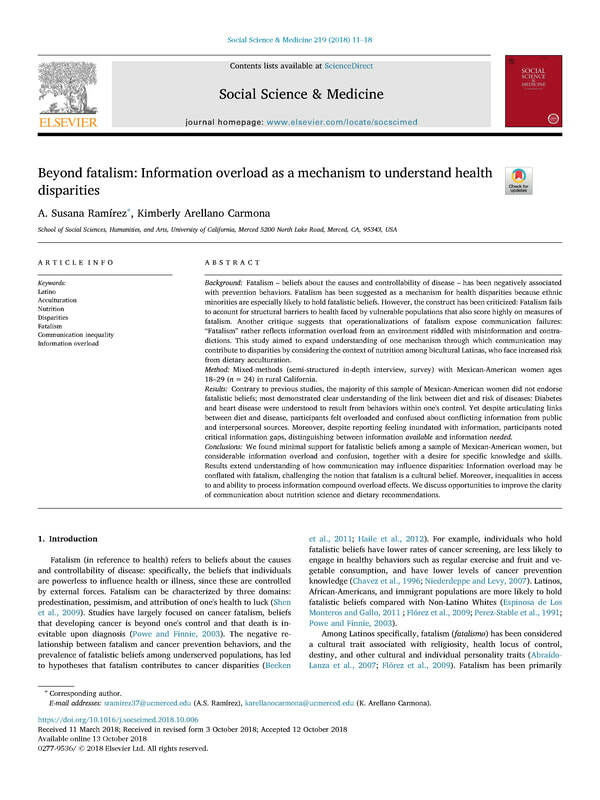 Click here to read the full paper or email for a copy if you can't access it. Heading to Atlanta for APHA 2017? 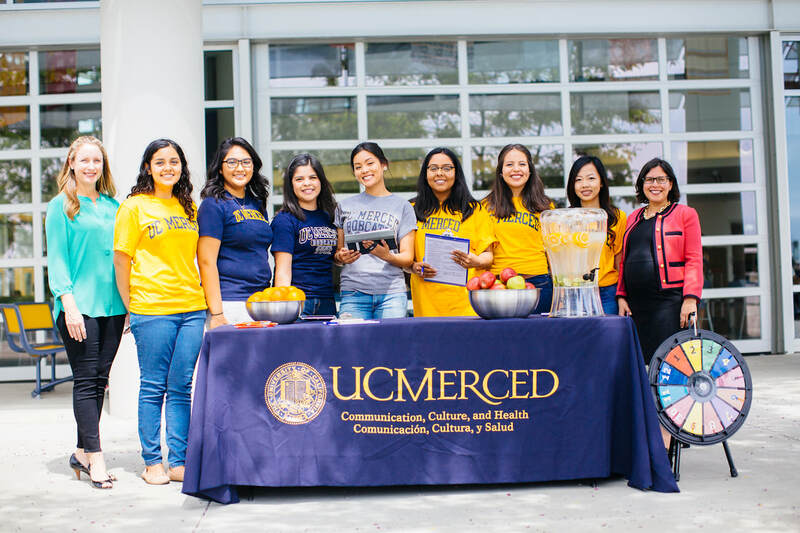 Come hear about our CDC-funded projects to build a culture of health in Merced County.